Sara Martinez doesn’t have children. Youngblood, 66, who is retiring after commencement ceremonies this week, has had that kind of impact on students and colleagues for 31 years at GCU. “He just has that type of personality,” explained Martinez, who is graduating Thursday and hadn’t taken a class with Youngblood until her senior year. “You just want to be around him. He is so friendly and compassionate. 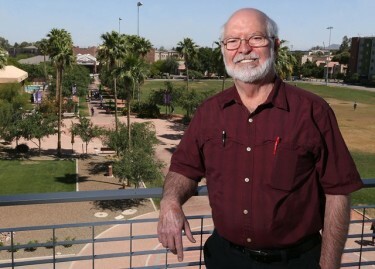 Youngblood is second only to fellow theology professor Dr. Michael Baird in terms of length of service among current full-time employees at GCU. Baird came on board in 1979, then was part of the hiring committee that brought in Youngblood three years later. A retirement party is planned for Dr. Youngblood from 1-3 p.m. Wednesday in the Prayer Chapel of the College of Arts and Sciences building. During those 30-plus years, Youngblood has seen his field of education go from the Department of Religion to the Department of Christian Studies to the College of Christian Studies and now the College of Theology, and switch between department status and full-blown college status three times. Youngblood served as the head of the department for a few years when it fell under the umbrella of the College of Liberal Arts and has had a hand in designing the content for several courses. 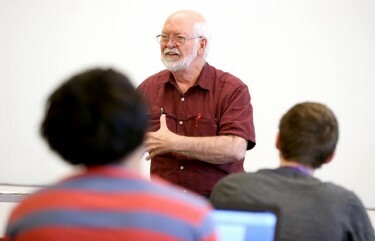 But, for most of his time, he has enjoyed serving as a professor specializing in systematic theology. Youngblood said he’s a bit of an old-school instructor who still believes that lectures are the foundation of teaching principles. And he begins every class with a time for prayer, taking the duties upon himself for freshman classes and relying on juniors and seniors in upper-level classes. “I grew up on lectures,” Youngblood said. “I realize there needs to be a variety of teaching methods, etc., but there is a reason why we have a system where we’re called professors, because we’re supposed to profess, or lecture. Sue Myers, coordinator of church resources at GCU, is a former student of Youngblood’s. Youngblood grew up in a Christian household, moving from Texas to Oklahoma to Kansas while his father worked on oil pipelines. He made his commitment to Jesus Christ when he was 11 years old, but initially went to college at Texas Tech as a math major. During his sophomore year, he said he felt God’s calling to prepare for vocational ministry, so he transferred to Hardin-Simmons University – a Christian liberal-arts school in Abilene, Texas — where he earned his bachelor’s degree. He later received his master of divinity and his Ph.D. from Southern Baptist Theological Seminary in Louisville, Ky. He became an ordained minister and had two stints as a pastor, in West Virginia and Nebraska, before feeling the urge to teach. He applied at many Christian universities and one night in 1982 got a conference call after church from GCU’s Dr. D.C. Martin (chair of the department), Dr. J. Niles Puckett (the school’s founding Bible professor) and Baird. He got his first full-time teaching job and has been here ever since. Baird said there are a lot of similarities between Puckett and Youngblood in that both are what he called “Southern gentlemen” – Youngblood just doesn’t have Puckett’s heavy accent. After Puckett and Martin retired, Baird and Youngblood began going to lunch once a week. Soon other faculty members joined in. Now, 20 years later, that weekly lunch date has become a tradition in the College of Theology. In addition to the weekly College of Theology faculty lunch on Thursdays, Youngblood eats lunch every Tuesday with Dr. Larry Barron, a professor with the College of Arts and Sciences. In just his second year at GCU, Youngblood established a chapter for Alpha Chi, a national honor society that promotes academic excellence and honors top students from all academic disciplines. He has overseen it ever since, even serving on the national council for many years (eight as its president). For Youngblood, teaching never was about climbing the corporate ladder or looking for better-paying jobs at other schools. As Dr. Youngblood’s nephew, I can say he is a very gentle, strong, wise uncle. I have always loved getting together with Clark and Marian for family reunions and holidays, and pleasant witty discussions and game nights we would have. I was happy to have Clark speak and pray at my wedding several years back here in San Antonio. Congratulations on 31 years Clark! Dr Youngblood was a mentor and friend during those college years. From the classroom, to lunches in the cafeteria, to worship at Hillside, to racket ball downtown, he was always a godly instructor.